A computer-enabled end user-driven method of creating and purchasing affordable custom- design furniture pieces, which allows end users to design unique furniture pieces to their own tastes and needs, rather than being limited to customising furniture by selecting from a limited choice of pre-defined components. The present invention relates to systems and methods for designing modular furniture, and in particular to computer-enabled systems and methods that are end user-driven. End users wanting to purchase furniture have the choice of mass produced or custom made furniture. Mass produced furniture is more cost effective to make and purchase, but this is achieved by offering end users a very limited number of design choices for a single piece of furniture. For example, an end user may be able to make limited choices about materials - for example, the type of wood, a style of leg, and/or a fabric covering. By contrast, custom-made furniture provides the end user much more freedom regarding design choices, but tends to be very expensive. It also often requires the input from a design professional - and indeed, many businesses flourish from providing these kinds of services, as many end users lack the design skills to custom design furniture. Examples include kitchen and bathroom furniture such as cabinets and benchtops. Despite their many differences, both mass produced and custom-made furniture have a limited life span from a design viewpoint. Although, both mass produced and custom-made furniture may be reworked to vary in appearance (e.g. re-upholstering a lounge, repainting a furniture item or changing hardware such as handles), this can be very expensive and/or time-consuming if done by end users themselves. The results can also be unexpected or simply not worth the effort. In addition, many mass-produced items are virtually "disposable" after a certain period of use, making re-working more trouble and expensive than simply discarding the item and replacing it with a newer one. A number of furniture design systems have been developed for home and office furnishing that are primarily intended to provide a one-time design for a piece of furniture (e.g. cabinets, shelving or other storage furniture items). These systems include do-it-yourself kits or flat-packed products that provide some interchangeable structural members - but with very limited choice to the end user as the structural members may be limited to a single furniture "range" and cannot be interchanged with structural members from a different range. These items are also typically one-time designs since often committing to one structural member may preclude the choice of other structural members (other than optional "extras" such as internal dividers, drawers and so on). For example, a particular style of cabinet door may only available in pre-specified dimensions. Therefore, if a cabinet body is not one of the pre-specified dimensions, then the choice of cabinet door is not available. (b) they do not allow for future modification of the structural and design elements so that the end user may redesign the designed furniture piece and easily change the structural and design elements to create a new piece of designed (re-designed) furniture. US 2003/0172003 describes a unified system of modular furniture components and a web- based computer software tool for designing and configuring office furniture, such as desks, shelves, work stations from that group of modular furniture components. The modular furniture components are designed with the software tool in mind and the tool is designed with the unified system in mind. The software tool of US 2003/0172003 includes a database of three dimensional (3D) modular office furniture components graphically selectable by a user. The modular components are selected and "dragged-and-dropped" in a 3D grid display to enable the user to design a finished configurable office furniture product from the selected components. Each component is a complete office furniture item. The database includes information such as description, price, technical specification, etc., for each component. Once the design is completed by the user, the tool provides a report including total cost, parts list, footprint, order form, etc., to the user so that the user can electronically place his/her order for the components of the designed product. (b) the system, tool and method of US 2003/0172003 derives its cost efficiency in mass production of a very limited palette of pre-defined furniture items, combined by a user to his or her needs. The method and system of US 2003/0172003 could not be scaled to meet the demands of the end user (home) market, by delivering cost- effective manufacturing of end user-driven (custom-made) furniture designs. This is because US 2003/0172003 does not contemplate unique designs of individual furniture items. US 2005/0200250 describes a furniture system that permits assembly, disassembly, and reassembly of a piece of furniture - optionally, into a different furniture configuration than the one disassembled. The system describes various connectors that provide flexibility in connecting furniture member parts - e.g. some do not require tools, and some involve co-ordinating grooves and rails to join connecting edges of opposing furniture members. The system of connectors of US 2005/0200250 suffers the disadvantage of being of limited use in connecting member parts to form a smooth surface, since the member connectors join at the edges rather than internally through the member edges. This creates an undesirable visible join between two member parts being joined in the same plane. Therefore, the connector system of US 2005/0200250 is in practical terms limited to use in items of furniture such as shelving, bookcases, entertainment units or other storage items. While US 2005/0200250 describes the ability to connect furniture member parts to form different furniture configurations than the one disassembled, this is limited to re-configuring existing combinations (using some or all of the existing parts) into different configurations or to add custom inserts rather than allowing users to custom-design a furniture item or redesign a furniture item. Modular furniture systems created for use in the office environment have the additional disadvantage that they do not have sufficient flexibility to meet the needs for use throughout the home, as the requirements for home furnishings are broader than for the office environment. US 2005/0027553 describes a computer-enabled method of customising, redesigning and purchasing furniture. The system includes a tool to assist a purchaser in choosing alternative, interchangeable structural and design elements for a previously designed piece of furniture to modify the design. It also allows the end user to choose structural and design elements based on design and associated cost, and allows for the future modification of said designed furniture. The system of US 2005/0027553 is thus configured to allow purchasers to semi-custom design furniture in-store or from a remote location, at a relatively affordable cost. The method includes future alterability of the designed furniture piece and the availability of customer service assistance in the design of the furniture. Similarly, "made-to-measure" design services such as Jali allow an end user to "design" through customisation of pre-determined designs. The customisation is limited to changing the sizing (width, height or depth) or hardware (handles). As such, these kinds of services share a similar limitation to US 2005/0027553 and other prior art furniture design systems in that they are limited to design customisation (semi-custom design) rather than actual custom design. An end user is required to choose a type of furniture item (e.g. bed, chair, cabinet or table) based on its design (style) and cost. In other words, an end user has limited ability to "design" a chair. (b) selecting predetermined design elements (e.g. shape, sizes, materials, coverings) for the selected design (style) of chair, bench, table and so on. Current semi-customisation services or systems do not allow an end user to take a component from, say a chair, and use it to build a table. Nor do they allow an end user to design a chair from available components. The design is constrained by at least the preexisting design and pre-defined components. Therefore, this system is really customization through the configuration of available pre-defined components, the available components being designed for a specific purpose. Manufacturing services such as Ponoko and Shapeways provide end users with access to digital manufacturing technologies such as laser cutting and 3D printing. Although this provides flexibility in design and allows end users to make products including furniture to an end user-driven design, it is still expensive as each design is individually manufactured. An end user uploads a design, say for a piece of furniture, and the "making system" calculates the cost and allows the end user to order the design. However, the designs are relatively constrained because they are limited to being made from 2D sheet material that can be made by combining laminar (2D sheet material) components that can be laser cut or designs that can be 3D printed. A disadvantage is that the structural forms created are relatively rudimentary, and yet expensive. Kitchen, bathroom and home office design systems are available that allow an end user to "design" their own kitchen> bathroom or home office. However, these systems involve pre- configured components (e.g. storage cabinets) or framing systems, and a range of options that are more akin to customisation than true design (e.g. different benchtop materials, doors and hardware). Similarly many retailers offer customisation of existing designs, through a choice of fabric; colour, or pre-configured modular components. This limits the design choices available to an end user - in a manner analogous to "customising" an order for a car (e.g. optional extras, manual or automatic gearing, tinted windows, choice of upholstery). Ultimately, the final product is not unique to the end user. It would be useful to have a computer-enabled end user-driven method of creating and purchasing affordable custom-design furniture pieces, which allows end users to design unique furniture pieces to their own tastes and needs, rather than being limited to customising furniture by selecting from a limited choice of pre-defined components. It is an object of the present invention to provide a new or alternative end user-driven design system and method for affordable custom-designed furniture, including for the home. D. assembly instructions, such that an end user can specify a design comprising a combination of atomic units, the combined atomic units forming at least part of a furniture item and being reconfigurable to form at least part of a different furniture item, the software tool assisting the end user to configure the atomic units such that the furniture item built is optimised to meet the end user's said one or more design requirements. (c) generating one or more reports for display on a visual display. The invention thus provides a new or alternative end user-driven furniture design system and method for custom-designing furniture that overcomes the problem of prior art furniture design systems that are not scalable to the end user market, or that provide only limited ability for end users to have input into the design of furniture products. For a better understanding of the invention and to show how it may be performed, a preferred embodiment will now be described, by way of non-limiting example only, with reference to the accompanying drawings and examples. FIGURE 1 is a flowchart showing a furniture design method according to a preferred embodiment. FIGURE 2 is a flowchart showing an alternative embodiment of a furniture design method than that shown in Figure 1. FIGURE 3 is a flowchart showing yet another alternative embodiment of a method for end user-driven furniture design than that shown in Figures 1 and 2. FIGURE 4 shows perspective views of four examples of molecular units (Figures 4A to 4D), created from a family of atomic units, which can be used to create lounge-type and bed- type furniture items using an embodiment of the end user-driven furniture design system. FIGURE 5A shows how two of the molecular units shown in Figure 4 can be combined to form a furniture item (shown in ghost) - in this case, a single seater lounge element. FIGURE 5B is a side view of an exemplary lounge-type furniture item made by combining two molecular units shown in Figure 4, with two different types of support part. FIGURE 5C is a perspective view of an exemplary furniture item (two-seater lounge element) made using the atomic units shown in Figure 4, shown from below the furniture item. FIGURE 6 shows perspective views of various exemplary furniture elements created by combining various molecular units, the molecular units in turn being created by combining various atomic units, in an embodiment of the furniture design method. FIGURE 7 shows different combinations of furniture elements depicted in Figure 6, combined to form a modular furniture suite. FIGURE 8 shows a plurality of different exemplary furniture types created using a limited selection of atomic parts, in an embodiment of the furniture design method. FIGURE 9 contains sample screens for a graphical user interface of an embodiment of the software tool (configurator) of the furniture design system. The software tool is being shown performing the embodiment of a furniture design method of Figure 3. FIGURE 10 is a sample tall storage unit created using a limited selection of atomic units, designed using an embodiment of the furniture design method. Figure 10A is an internal, front view of the storage unit. Figures 10B and IOC are perspective views of the storage unit from the front, with the parts exploded then joined to show the atomic units used to create the storage unit. FIGURE 11 is a sample low, long storage unit created using a limited selection of atomic units, designed using an embodiment of the furniture design method. Figure 11A is an internal, front view of the storage unit. Figures 11B are perspective views of the storage unit from the front, with the parts exploded then joined to form the furniture item. FIGURE 12 is a sample low, small storage unit created, designed using an embodiment of the furniture design method. Figures 12A and 12B are perspective views of the storage unit from the back, with the parts of the open component of the storage unit exploded then joined to form the furniture item. Figure 12C is the same storage unit with the top shown in cross section. Figure 12D shows the interior of the storage unit. FIGURE 13 shows the exemplary storage units of Figures 10 to 12. Figures 13A, C and E are front views, and Figures 13B, D and F are perspective views. FIGURE 14 shows additional exemplary storage units than illustrated in Figures 10 to 13. Figures 14A, C, E, G, I and are perspective views of various storage units. Figures 14B, D, F, H, J and L are corresponding technical drawings of the same storage units, respectively. FIGURE 15 shows an embodiment of a design method performed by the design system. FIG URE 16 shows an embodiment of a design method using the furniture design system according to an embodiment. The initial stages of the method show the evolution of a furniture item using the system and method. The final stage represents re-configuration of the same parts to make different furniture units. Table 1 is a dictionary of terms defined according to the invention. The elements of the invention are now described below. The invention provides a new or alternative furniture design system and method for custom-designing furniture. At the heart of the design system is a suite of "atomic" units - the basic repeatable units of matter (a suitable building material) used to construct a plurality of furniture items from the design system. Atomic units are analogous to atoms, the basic units of matter. They have the advantage of being able to be re-purposed from use as one part of one furniture item for re-use in a different type of furniture item. This allows components to be re-purposed to create a new or different furniture item. Groups of atoms (atomic units) form molecules (molecular units). A molecule may consist of a single element, i.e. a plurality of the same type of atom such as in oxygen 02, or different elements, i.e. different types of atoms such as in water Hz0. The atomic units of the furniture design system have been designed based on an analysis of the most commonly repeating minimal forms occurring in a wide range of furniture types. Each atomic unit represents such a commonly recurring minimal form or basic unit of building matter made of a suitable material, optimised to perform as a standardised component. Using this basic recurring form (atomic unit, or atom) thus provides flexibility in building a plurality of finished furniture items. In addition, as the basic recurring form (atomic item) is a minimal form, it can be used interchangeability between different furniture types. Continuing the chemical structure analogy, two or more atomic units can be combined to form a molecular unit - part of an item of furniture. Molecular units are combined to form a solid substance (a piece of furniture). (d) a pre-existing item of furniture to be re-configured to form a new furniture item. The use of atomic units provides greater design freedom than prior art furniture design systems. This is because an atomic unit is a basic form or building block, rather than a pre- configured structure or assembly of parts. A pre-configured assembly of parts such as an entertainment unit can only be customised as its minimum form is pre-determined and the end user is unable to participate in any design decisions of the pre-configuration. Thus customisation is more limited than custom designing to an end user's individual wishes. The furniture design system provides end users with choices from a suite of atomic units categorised-, say, according to function. The system includes a plurality of suites of atomic units, the suites of atomic units being stored as a network accessible data collection (e.g. database, flat files). (c) other categorisation such as context of use types (e.g. moisture resistant, heat resistant, moisture and heat resistant). (d) categorisation by ranking (e.g. the end user can "rank" part types according to personal preferences such as "favourite", using any suitable ranking system). In an embodiment, the design system includes a software tool (configurator) that categorises atomic units using metadata associated with each data file (each atomic unit has its own data file). The software tool (configurator) can be downloaded onto an end user's own non-volatile machine-readable storage medium (e.g. a smartphone, a tablet, a computer or other electronic device with processing capacity). Alternatively, the configurator (software tool) can be made accessible to the end user over a network, web- enabled (used through a web browser) or be provided as a service (SaaS). Categorisation of the atomic units using metadata allows categorisation in a plurality of ways, to assist end users in the design process. Metadata puts the required relationship of the objects (part types) into place according to the end user's needs. The end user may not necessarily be aware of all the different forms of categorisation. A single atomic unit might be severally categorised by the configurator software tool as a top part, a back part and a side part, for example, or as "bed part", "lounge part" and "desk part"). This is useful if an end user is simply trying to choose parts to perform a particular function - e.g. "I need something for the back of my furniture item", or "I need parts to build a cabinet". The interchangeability of atomic units between categories of part types provides design flexibility to the end user as well as cost and manufacturing efficiency to the design system. End user furniture customisation methods do not allow parts to be interchanged between furniture types or functions. The furniture design system includes a software tool (configurator) that allows an end user to perform the furniture design method. An end user can use the configurator software tool of the furniture design system to make their own designs, using any combination of atomic units. Thus the software tool includes programming instructions to perform steps of the furniture design method, or to allow a user to request certain steps be performed. The rules for furniture design and construction and the intended purpose for use of the designed furniture item are contained in business rules for construction, which in the preferred embodiment is contained in a database used by the configurator. Business rules guide the design, depending on the intended use (e.g. how long does this need to last, is this for indoor and/or outdoor use, does the item need to be heat and/or water resistant, does this benchtop need to be wheelchair accessible). If an end user indicates that a particular item is intended for a particular use (e.g. kitchen benchtop), or for a particular geography (e.g. humid climate), the configurator will provide choices to the consumer that will assist to meet the desired use (e.g. if a kitchen benchtop, the end user is provided with a choice of heat and water resistant benchtops). The rule restricting choice to the desired use can be overridden by the end consumer. End users often approach design by considering the context of use - that is, the use or purpose for a furniture item. This approach requires appropriate business rules of construction to be utilised by the configurator. In an embodiment, these rules are not binding on end users but are options provided to allow the end user to interpret the design in the context of an intended use. These rules of construction are aids/guidelines to help the end user be informed of the strengths and/or detriments of the end user's design choice. Design can have different qualities depending on its context, since some design attributes in one context can change, for example, from being beneficial to being detrimental as the context changes. Therefore, the rules of construction can only properly apply when the context of use is known. This includes considerations such as designing a home office compared with customizing a commercial workspace, use of different materials (e.g. plastics, metals (laser cut), or novel materials (e.g. rice husk, recycled plastics, rubber), water resistance (e.g. planter box or cabinet). Generally, the configurator's rules of construction can be applied in a variety of circumstances, without the need to detail each and every use individually. However, the configurator allows preferential or exceptional uses to be input by an end consumer - for example, an end user can specify a need for hypo-allergic materials or for heat-resistant materials, or a need to withstand loads exceeding that of a human (e.g. a platform that will be stood on by multiple people needs to withstand a multi-person load). The rules of construction form a subgroup of business rules for use by the configurator, and an end user is enabled to specify requirements and/or preferences (e.g. by selecting options or entering input). These requirements and/or preferences help the end user weigh up different use options as aids/guidelines as to the strengths and/or detriments of the end user's design based on the required technical specifications to meet the end user's desired use. 11. Context Sensitivity: the context of use may require alignment with established design signatures or heritage requirements. For example, the end user-driven furniture design may be required to be in keeping with Eames' design signatures for chairs. Context Sensitivity may also take into account use such as when specifying a writing desk for office use to include cable holes for network and power cables. Likewise, thermal qualities, tones, rigidity and other features can be included into context when and where appropriate. In an embodiment, the process of an end user creating a design requires the user to specify preferences, such as those above. The user's preferences are captured from the user, for example, by the user inputting answers to a series of questions about the context of use, materials, and so on. This preference information from the user regarding preferences for use and context (hereafter "contextual preference data") helps determine the options that are available for designing and building a furniture item to meet the user's preferences, e.g. for use .and context of a specific design, in an embodiment, context preference data includes additional criteria captured from the end user - such as preferential styles, heritage requirement(s) if any, and other detail. This is to ensure appropriate materials are used to achieve the desired style. Often there is not the language available to ask specific questions, so a visualisation tool may be used in conjunction with the end user-driven furniture design tool, to capture preferred "design signatures". Such design signatures can be used by the configurator so that elements of design can be built into the business rules so that, once the end user- driven furniture design has been formed, then signature elements can be used to place the design in keeping with the context that it is to be placed. The signature elements can assist end , user-driven furniture design when context is important such as in heritage settings. For example, the end user-driven furniture design may be for roof shingles to replace a thatch roof on a Japanese merchant house in the context of the Edo period. The end user-driven furniture design can input use, size and context sensitivity as well as additional options to provide advice as to the most suitable shingles for use. (c) combining the formed furniture elements to make modular or more complex furniture items. An end user may select one or more atomic units (see step 110 in Figure 1) as the first step in the design method. The selection may be based on an earlier decision to design a specific type of furniture (e.g. a buffet for a dining room) or on a furniture template for a specific type of furniture (see step 310 in Figure 3). Alternatively, the end user may simply select atomic parts to combine without a specific pre-defined type of furniture in mind (e.g. to fill a space in a room without requirement to fulfill a single specific functional purpose) - see step 110 in Figure l and step 220 in Figure 2. An end user makes the relevant selection by selecting a representation of a desired atomic unit on a graphical user interface (GUI) of the software tool. The software tool includes programming instructions to associate an action on the visual representation of an item with a corresponding action on that item. For example, the selection of an atomic unit from the data collection of atomic units can be made by dragging and dropping a visual representation (e.g. a 3D drawing) of the desired atomic unit onto a "workspace" (alternatively referred to as a "canvas" or "storybpard") depicted in the software tool GUI. The end user can then combine selected atomic parts using the configurator (software tool) to form a piece of furniture (see step 120 in Figure 1). This can take place in one or more steps, and is achieved by selecting one or more subsequent atomic units after the first selection and adding those to the selection (e.g. adding one or more 3D representations of selected atomic units (parts) to the workspace). (d) review the total price (step 170 in Figure 1). In an embodiment, the software tool (configurator) of the furniture design system includes a calculation means including an algorithm for real-time calculation of a total price, based on the number and nature of atomic units selected. This dynamic pricing calculator allows total costs to be calculated as atomic units are selected by the end user. The price changes in real-time as different atomic units are selected or deselected, or as molecular units are formed (i.e. a running tally). The design is added to a shopping cart in parts, allowing realtime calculation of price or specification as parts are added, removed or changed. In further embodiments, the dynamic pricing calculator can adjust a price taking into account the closest manufacturing or warehousing location to the location specified by the end user (either manually specified or specified through positioning data). This allows delivery costs to be factored into the total price as atomic units are selected by the end user. This is an advantage because delivery costs are often significant to an end user in making a final purchasing decision but are often not calculated until after items to be purchased have been selected, wasting the end user's time if delivery costs are so significant as to persuade the end user not to proceed further. Referring to Figure 15, an embodiment of a design method performed by the design system is shown in which the system receives an order (step 1510) for a furniture item designed using the furniture design tool (which includes programming instructions to generate a purchase order). The system accesses a database of manufacturers and matches the order to a suitable manufacturer (e.g. the closest local manufacturer) - see step 1520. The local manufacturer fulfills the order and makes the furniture item designed by the end user (step 1530). The local manufacturer flat packs and ships the item to the end user (step 1540). The advantage of using a local manufacturer is it reduces shipping cost and time, and the need to centrally ship and warehouse inventory. The local manufacturer's pricing has already been included in the price calculated by the dynamic pricing calculator and delivered to the end user. Therefore, the price of the order accepted by the end user is the price the system will charge the end user, including for manufacture and delivery by the matched local manufacturer. In a still further embodiment, the furniture design software tool (configurator) computes a "furniture design" from a plurality of atomic units to build a furniture item as specified by end user in their proposed furniture design and their functional requirements. End user-driven furniture design enables end users to specify intended use and propose a design constructed from a plurality 6f atomic units to build one or more furniture items, where each design individually forms a furniture item so as to enable all furniture items collectively to form a joinable and/or interchangeable collection of furniture items with an intended use. The configurator allows an end-user to choose the type of joins between atomic units to engage the atomic units to each other and/or to a molecular unit (or multiple atomic or molecular units) so as to form a join suitable for desired use (as captured in the contextual preference data). For example, if two atomic units are intended to create a solid structural form to support compression and/or tension then the join selected would be appropriate to suit those circumstances of desired use. The choice of join must meet the appropriate business rules. (b) a pivotally engaging join - such as between a cupboard door to a cupboard, or a reclinable back to an armchair or chaise. (c) the required vectorial relationship between an atomic unit and its physical relationship with its proposed context of use (e.g. how one atomic unit sits in relationship with another atomic unit such as door handles must sit on the outside of a cupboard door and a cupboard door must sit on the exterior of a cupboard and not at the back of the cupboard closest to a wall). In other words, where atomic units have a vectorial relationship or positioning in space including an up-down and an exterior-interior positioning of one or more requirements, the configurator applies requirements regarding vectorial relationship to the atomic units such that a relative position of an atomic unit to its context allows a furniture item to meet an intended functional use. End users both individually and collectively have a need to participate in design, since individual end users often live together, albeit often co-existing with distinct needs, preferences, or requirements at specific times. Therefore, form (appearance) and function (use) needs to be taken into account by the individual and collectively to meet all requirements. When the function of a furniture item is specified with the end user's furniture design, there is a matching of "business rules" before the design can be accepted. These business rules enable the furniture item(s) to be formed and/or to be reconfigurable, according to the end user's specified furniture design (form) with intended use (function). c) be converted for use as a bed/sleeping bench. Thus, the collective and individual end user needs consist of the requirements for the children, as well as the needs of their parents/carers/guardians at other times. The above requirements must be able to meet different business rules since the table must be able to support a person sleeping, be alterable in height to suit children for an art class, be able to be cleaned and to be extendable to have twelve people seated. Therefore, the customisable furniture system is able to receive input about specific requirements for a variety of intended uses from an end user. This includes input specified by distinct end users who are cohabitating in a single living environment. Another example is where end users specify a common design to make up three units of furniture which have the same look and purpose, but where each end user has unique and distinct needs. For example, the three units maybe lounge chairs for mother, father and a child whose weights, sizes and uses for the lounge chairs are very different. The designs of these three units of furniture are collectively made up of, say, 40 atomic units to form a furniture suite. The furniture items made from, say, the 40 atomic units is accepted by the customisable furniture system's business rules, if for example, they meet the requirements specified by the engineering tolerances, safety parameters and other criteria, which are all contained in, or interpreted by, the configurator tool/system's business rules. Once a design is accepted by the customisable furniture system's business rules, then the end user-driven furniture design is able to be built for a specified use (such as home use, not commercial use), tolerance of use (utilised for four hours a day, then the expected lifespan would be for 8 years), cost and other criteria as specified. This collection of furniture item design and use(s) together make up an acceptable furniture design as submitted by the end user and accepted by the configurator tool/system if they meet the requisite business rules. If the end user-driven furniture design is NOT accepted by the business rules, then a warning notice appears, giving the end user the option to calculate an alternative furniture design or over-ride the business rules and proceed with the item. This alternative calculation can propose an alternate design with the addition, removal or a new or different combination of features. A revised design may be proposed when, for example, an end user constructs a design via the configurator tool for a chair with only two legs specified, which is unstable for its specified use(s). Here, the furniture design software configurator tool computes and proposes an alternate chair with more than two legs based on business rules, so that it meets its intended use of stability. use, so that a revised design is proposed, which uses an alternate selection . and/or combination of atomic or molecular units, to meet the furniture design's intended use. This occurs via the atomic unit combination - furniture design calculation step as assessed by business rules. b) then the proposed design will be accepted. iv. using different atomic units, based on specific business rules, specifying construction steps for specified outcomes, until the above sub-steps under c) meet the intended use requirements for the design. Alternatively, an end user can over-ride the business rules and be allowed to proceed even though the system indicates that the proposed design does not meet the technical requirements required to meet the end user's indicated intended use. These above steps and sub-steps may require many iterations (sometimes referred to as "reiterations") until the number and combination of atomic units for the furniture design's intended use is calculated as being a suitable revised proposed design and, if it meets the end user's taste, finally becomes a settled design. Such iterations or re-designing to propose a new design may involve initially reducing the number and combinations of atomic units, which changes the parameters of the furniture design's intended use. Reduction of atomic or molecular units is, in this alternate embodiment, the first step so as to reduce cost and to simplify design to meet intended use. The system may include a customer support trigger whereby after a specified number of iterations (or upon request, or when a notice first appears that a design will not meet an end user's intended use), customer support intervention is triggered to provide assistance to the end user during the design process. 2. psychologically engaging the end user to participate by adding atomic/molecular units to the design. This takes on a positive reinforcement of participation and construction by adding to a design to make it better (as opposed to the negative reinforcement of destruction). 3. the intended use meets the required business rules. Once sub-step 1) is met but the requirements of sub-step 3) are not met, then sub-step 2) will add atomic or molecular units so an increase and change in the combination of atomic units is calculated, so the intended use is accepted by the business rules, for a new proposed design. Therefore, there may be many iterations until the revised proposed design is considered suitable as determined by business rules preset, the end user's preference and acceptance of the proposed design(s) and other criteria. When, for example, the new proposed design's furniture items are to be made, then a new price and Intended use will need to be calculated, which may also be specified within a business rule, so as to restrict design options by price and to select atomic or molecular units made for material that is more price efficient. 3) performing a check that the end user-driven furniture design complies with, pre-set business rules (as discussed below). A further example is if only 30 atomic units are required to make the specified furniture items as specified within the new proposed design, as opposed to the previous 40 atomic units, then the specifications detailing cost, use and other criteria will be adjusted to include only the 30 atomic units used, so long as there is compliance with pre-set business rules. This revised design using a combination of 30 atomic units can be accepted, once the business rules specifying, for example, the means of construction, the engineering capacities, safety parameters, intended used and other criteria are met, or if the end user indicates a preference to over-ride the system. 2. falls within an acceptable range of total atomic unit numbers (e.g. the system can indicate that an acceptable range of total atomic units is between 1 and 40); or 3. meets an alternative use within conditions specified. The system also allows the number of atomic units to be revised for aesthetics. For example, increasing the number of atomic/molecular units to propose a new design, or revise an existing design, in line with the furniture's intended use is calculated by adding one or more atomic units into the furniture design to meet the furniture's intended use until the revised design, as determined by the combination of atomic units is meets the furniture unit's intended use. 3) is compliant with pre-set business rules. To continue our example, if proposed furniture designs are made from 30 atomic units for a specific category of use, tolerance, cost and other criteria as specified by end user(s), then the revised design and combination of atomic units may be reiterated as determined by increasing the number of atomic units to meet the furniture design's intended use. d) end user's description for intended use: as expected by an owner with discussion with a designer or reference to the business rule's data, which confirms that specific materials are suitable, for example such as, for outdoor use. Determining whether attributes of the furniture design and/or the revised design as stipulated via the combination of atomic units comply with a plurality of pre-set business rules is what is to be achieved in the above steps. This also enables a furniture design's intended use to become part of the design process as an optimised design. Therefore, form and function are enabled to be matched specifically to the end user's needs in a dynamic and end user specified manner. c) determine if the features meet the required features as specified by use. Features here are tolerances and requirements as extracted from intended use and compared to the required business rules. b) computation and reporting of the highest purpose or most demanding requirements for end user-driven furniture design(s) features. a) "successful" indicating the end user-driven furniture design(s) with atomic unit(s) suitable within the range of possible furniture items to be acceptable. For example, the furniture items with atomic units meeting the acceptance criteria are nominated as successful, although the end user-driven furniture design can still be improved upon by a subsequent end user-driven furniture design input; or b) "not successful" indicating that the end user-driven furniture design's atomic unit combinations were out of range of possible intended uses. If there are no furniture items considered acceptable in terms of design-use then a sub-step is inserted between steps a) and b) above so that proposed designs will be presented to meet an acceptable design-use criteria. In this way, the system is performing modeling of design options for an end user to review or over-ride. The configurator tool performs at least one of the functions that would otherwise require user input (e.g. calculating a stress load). These functions would normally be manually performed by a user to test of the validity of acceptable design-use or to enable "tweaking" a design to become an acceptable design-use. This determination of design-use testing by programming instructions generates acceptable design-use outputs. This design-use testing automates the generation of suitable design proposals to' the end user to meet form-function criteria based on the end user's initial design. This enables end user / end user purpose driven design, which is advantageous over current option based systems, which limits the options to pre-designed furniture items. In an embodiment, the software tool of the design system can assist end users in the design process by providing access to a suite of design templates. The end user commences the design method by selecting a template for the desired type of furniture (see step 310 in Figure 3) - say, for a bed base. As with other embodiments, starting with a template still allows end users to review the design, change their minds or modify the design before accepting a final design (steps 320 to 340 in Figure 3). In another embodiment, the software tool of the design system assists end users to modify an existing piece of furniture (see Figure 2). The end user can start by selecting atomic units to add to the workspace, the atomic units being used to configure a module that is added to the existing piece of furniture. The existing piece of furniture may be one that was originally designed using atomic units from the design system, or any other existing piece of furniture. Alternatively, the end user can use the software tool to analyse the existing furniture item into component parts, which can be re-configured and combined with atomic units from the design system to create a design for a new piece of furniture. This is useful, say when an old furniture item is no longer useful in its current form, or when an end user wishes to re-use part of a furniture item to 're-purpose' (upcycle) a piece of furniture. (b) the end user creates an image (e.g. a drawing, an approximate representation) of the pre-existing furniture item using the design system. The pre-step(s) allow(s) the existing furniture item to appear in the workspace of the software tool for selection by the end user as a first step in the re-design of the furniture item (see step 210 in Figure 2). The end user is able to select atomic units (step 220) to combine with the existing furniture item, or (a) component(s) thereof (step 230). As with other embodiments, the end user is able to review (step 240), re-start (step 250) or modify (step 260) the design before finalising it (step 270). The price calculator keeps a running tally of costs during the design process (step 280). (j) access to a virtual marketplace, which allows "designers" (in any sense of the word) to use the software tool to design one or more furniture items and to "sell" their designs to end users who can use those designs as a "furniture template". A end user can purchase an item of furniture made specifically to the designed template, or modify the template to suit individual needs. A suitable compensation model is provided to return a financial benefit to the designer. A range of atomic units stored in a data collection is made accessible to an end user using the software tool (in-store or remotely, through a network such as the internet, the cloud, a local-area or wide-area network). The flexibility in the design system arises from having a family or suite of atomic units, which can be combined with identical atomic units or different atomic units to make up different molecular units. A plurality of molecular units makes up a solid substance (a piece of furniture). The molecular units and/or new design specifications are enabled to be electronically delivered to manufacturing locations that are physically closely associated to the intended delivery point. Alternatively, if there are manufacturing locations that are under utilised, then they may be selected for their price advantage over other manufacturing locations. Manufacturing locations are only available if they meet an accepted standard of manufacture as specified within the business rules. An end user-driven furniture design once specified is then to one or more approved manufacturers, who then state their availability and provide a cost estimate to build the design. Example 1 includes a sample categorisation of atomic units, by functional part type (structural or non-structural) and again into subcategories (top part, side part, etc). Categorisation relies on metadata associated with each atomic unit, so that a single atomic unit manufactured can be categorised in a number of different ways simultaneously. The categorisation assists the end user to find and select an atomic unit. For example, an end user wishing to design a furniture item can look for suitable "top parts", "base parts", "front parts", "back parts" and "side parts". However, a top part is not constrained to being used , to as part of a "top" and can also be used to form a "side" of a piece of furniture, as illustrated in Examples 3 and 4. Example 1 includes a sample categorisation of atomic units, by functional part type (structural or non-structural) and again into subcategories (top part, side part, etc). (d) materials (e.g. a sheet material such as particle board, MDF or plywood made from timber, risk husk or other suitable material; glass; metal; plastic). (c) interchangeable between different furniture items within a single furniture type and also between different furniture types. Thus a "back part" atomic item for a bookcase can be used as a "top part" for a coffee table (see Example 3). (c) replacing the top and base parts of a storage unit, say, with parts of a longer dimension to enable expansion of the storage unit to accommodate more content. An atomic unit is different from furniture components of the prior art modular furniture systems, because the atomic unit of the furniture design system and method has been designed through analysis of a plurality of furniture items to identify a series of minimum recurring forms. This allows custom design of furniture items, because end users are not constrained to choosing from pre-defined 3D component structures. Figure 4 contains an exemplary family 400 of molecular units 410 suitable for creating furniture types "modular lounge" or "bed". Each molecular unit 410 has been created using a plurality of atomic units. Putting together different atomic units or the same atomic units in a different way allows the construction of a different molecular unit. A molecular unit forms an element (a 3D component or module) of a furniture item. A furniture item is typically formed from combining two or more molecular units. This is demonstrated in Examples 2 and 3. In Example 2, a plurality of atomic units is combined to form molecular units - the different seat base elements (labelled 410a and 410d) and seat back / bedhead elements (labelled 410b, 410c and 410e) illustrated in Figure 4. These base and back elements can be combined to form various furniture items as shown in Figure 5. 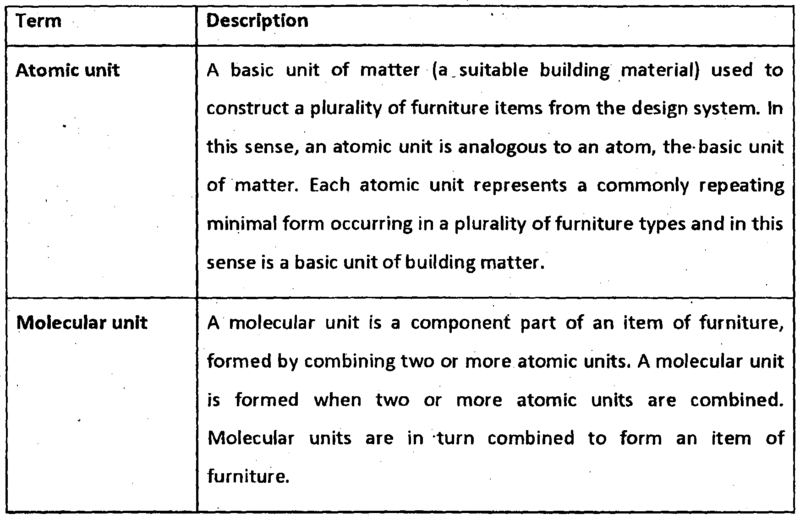 Other base and back elements are also possible using a different combination of atomic units, to form different furniture items (see Figure 6). The furniture items of Figures 5 and 6 in turn make up the modular elements of a modular furniture suite, as shown in Figure 6. This is described in more detail in Example 2. The end user-driven furniture design system provides a plurality of "atomic units" - or commonly recurring minimal forms (examples as referred to in Example 1). Figure 4 contains an exemplary family 400 of molecular units 410, each made from a plurality of atomic units. These molecular units 410 are suitable for creating seat base furniture elements and/or seat back / bedhead furniture elements. (c) item 440 is an example of a "base part" type atomic unit. Items 410a and 410d are representations of "seat base" components for a furniture type "modular lounge". Items 410b, 410c and 410e are "back" components for a modular lounge (seatback) or a single bed (bedhead). Item 470a is an example of a "support part" - namely, one style of feet that can be used. The molecular unit 410a depicted in Figure 4A will form the seat base component of a lounge furniture item (see Figure 5). Figure 4B is a perspective view of another molecular unit - labelled 410b, which can be used to form the back component of a single seat of a modular lounge-type furniture item (see Figure 5). Unit 410b can also be used to form the back component of a single bed - i.e. an upholstered bedhead for a single bed. (f) an example of a "top part" type (item 460). (b) a seat back or bedhead component (labelled 410c). (c) two different "side parts" (item 420c and 420d) in the back / bedhead component 410c. Figure 4D shows a perspective view another configuration (molecular unit labelled 410e) of the same atomic units used to create the lounge back / bedhead component in Figure 4C (labelled 410c), to make a mirror image molecular unit (labelled 410e). Figure 5 shows a lounge-type furniture item 500 made by combining the molecular units of Figure 4A. (c) soft furnishing parts - padded seat and back (items 480a and 480b, respectively), to form a finished furniture item 510 (shown in ghost and in side view in Figure 5B). Figure 5B is a side view of the lounge furniture item of Figure 5A, except with two different types of support part - castors (item 470b) and feet (item 470a). The soft furnishing parts (items 480a and 480b) can be seen in shading. Figure 5C is a perspective view of a different furniture item (a two-seater lounge element, 520) made by combining two of the lounge items of Figure 5B, shown from below the furniture item 520. Figure 6 contains perspective views of exemplary lounge-type and bed-type furniture modules 600. Each modular element is made from a plurality of atomic units being combined to form molecular units, which are in turn combined to form a furniture item - similar to the process as shown in Figures 4 and 5. (b) lounge back. component 410b. Lounge modular element 620 combines lounge seat 410a with two lounge back molecular units 410b to form a corner element. Modular element 630 combines lounge back molecular element 410b with a longer seat base 410c to form a chaise longue. Modular element 640 combines a wide lounge back molecular unit (labelled 410d) with a wide seat , base modular unit (labelled 410e) to form a two seater lounge. Each of modular elements 650 and 660 is an ottoman, made with the wide seat modular element 410e. Element 660 is the same as element 650, save that the furniture item provides storage within the ottoman base. Modular element 670 is a narrower ottoman made with a single lounge seat molecular unit - item 410a. Figure 7 shows different combinations of modular elements depicted in Figure 6, to form a suite of modular furniture 700. Rows A, B and C of Figure 7 are exemplary modular lounge suite configurations made using the above-described combinations of atomic units to build molecular units, the molecular units in turn used to build lounge components. Row D of Figure 7 shows three different bed frame configurations possible using the same family of atomic units as used for the lounge suite configurations in rows A to C. As seen above, the furniture design system provides a plurality of "atomic units" - or commonly recurring minimal forms. This provides flexibility in use, as each atomic unit can be used interchangeably with other atomic units to make a plurality of different items of furniture or parts thereof (furniture components). It also allows a furniture item to be reconfigured by changing, removing or adding atomic items. Example 3 illustrates how the atomic units of the design system are interchangeable across a plurality of furniture types. The interchangeability of atomic units allows the furniture design system to be cost effective, as atomic units can be pre-fabricated and yet provide significant flexibility in design choices as end users are not limited to pre-defined 3D components. (i) atomic unit 875 is used as a top part for side cabinet/buffet 890 and for bench 897. Figure 8 demonstrates how a single atomic unit can be categorised (and used) according to structural function (e.g. back part, side part) but can also be interchangeably used as different functional parts (e.g. atomic item 850 is a back part in a sidetable 820, but a side part in coffee table 870). The furniture items also include interchangeable support parts e.g. 470a (feet). Other support items (e.g. castors), hardware parts (e.g. handles), accessory items and ornamental items can also be combined. The furniture design system and method retain the design freedom of bespoke systems and methods, because an end user is allowed design freedom to create furniture items through any combination of atomic units, and then again through different combinations of molecular units (furniture elements created using atomic units). A user can commence the design process by accessing the software tool (configurator) to perform the furniture design method. Various embodiments of the furniture design method are shown in Figures 1 to 3. Figure 9 shows exemplary screens of a graphical user interface of the software tool performing the furniture design method of Figure 3. This is discussed in more detail in Example 4. An end user who uses the furniture design system to design an item of furniture can preview the designed furniture item in situ - namely, positioned in a room, including in the end user's room of choice. This is possible because the software tool (configurator) in an embodiment includes a visual representation feature, which is configured to allow an end user / designer to preview the item being designed in a room, including using augmented reality technology to view the item in a room photographed or filmed by the end user (e.g. using a webcam or camera in a portable device). This enables the designed furniture to be viewed in position (including being moved around the room and also rotating the item (or the room) to view it from different perspectives before committing to purchasing the designed furniture. An end user accesses the configurator (software tool) to design a storage unit. An exemplary GUI of the software tool is shown in Figures 9A to 9C. 2. once the user has selected a furniture template, the screen changes to display a workspace (screen 920 in Figure 9B). The selected template is displayed on the workspace; . Figures 10 to 14 provide a more detailed understanding of the design process, and examples of storage units that can be designed using simple combinations of atomic items. FIGURE 10 is a sample tall storage unit created using a limited selection of atomic units, designed using an embodiment of the furniture design method. Figure 10A is an internal view of the storage unit from the front. Figure 10B is a perspective view of the storage unit from the front, with the parts exploded so that the different atomic units can be viewed. Figure IOC is the same view as Figure 10B with the atomic units joined to form the furniture item. The furniture element/component labelled 1010 and the element labelled 1020 of furniture item 1000 in Figure 10 use many of the same parts and differ only by the presence of front parts (doors) in 1010 and a different configuration of internal shelving. The same atomic units used as top parts of furniture item 1000 are used as top parts for furniture item 1100 in Figure 11. However, different side elements are selected, making furniture item 1100 and its component elements 1110 and 1120 in Figures 11A and 11C a more squat style of storage unit than the storage unit in Figure 10. Figure 11B includes an additional modular element (labelled 1130), which is a cube storage element - the same as element 1220 in Figures 12 and 13). FIGURE 11 is a sample low, long storage unit created using a limited selection of atomic units, designed using an embodiment of the furniture design method. Figure 11A is an internal view of the storage unit. Figure 11B is a perspective view of the storage unit from the front, with the parts exploded so that the different atomic units can be viewed. Figure IIC is a perspective view of the storage unit of Figure 10B, but with an additional cube storage element 1130 and front parts (doors) on component 1110. The various atomic units used to create this design can be seen. The storage unit of Figure 11C (with or without support parts such as feet or castors) is suitable for use as is as an entertainment unit. Alternatively, it can have legs added, to convert it into a sideboard suitable for a dining area (not illustrated). Replacing the top parts and base parts with atomic units with more depth can convert the storage unit into a window bench with seating on top and storage underneath. FIGURE 12 is a sample low, small storage unit 1200 created using a limited selection of atomic units. The storage unit 1200 has been designed using an embodiment of the furniture design method and comprises two furniture components - an open element 1220 and a closed component 1210 (i.e. with a door). Figure 12A is a perspective view of the storage unit 1200 from the back, with the view of the open component 1220 of the storage unit exploded so that the different atomic units that form component 1220 can be seen. Figure 12B is a perspective view of the same exemplary storage unit 1200 as in Figure 12A with the atomic units joined to form the furniture item. Figure 12C is the same storage unit 1200 as in Figure 12B, with the top of the storage unit 1200 shown in cross section. Shown are cam locks that are used to hold the parts together - e.g. to hold the back part to the top, the side parts to the top and the adjoining top parts together. Figure 12D is the same storage unit 1200 again, with the top removed so that the interior of the storage unit can be seen. Cam locks can be seen holding the back part to the side part, as well as the two back parts to the dividing part in the middle. Figure 13 shows the exemplary storage units of Figures 10 to 12. Figures 13A, C and E are front views, and Figures 13B, D and F are perspective views. A number of the same atomic units are used in each of the different furniture items, exemplifying the interchangeability of atomic units. For example, each of furniture elements 1110, 1120, 1010, 1020, 1210 and 1220 uses the same top and base parts (these parts being interchangeable in function between each of these furniture elements). Figure 14 shows additional exemplary storage units than those illustrated in Figures 10 to 13. Figures 14A, C, E, G, I and K are perspective views of various storage units - created at least in part using multiples of the cube form. Figures 14B, D, F, H, J and L are corresponding technical drawings of the same storage units, respectively. Cam locks, hinges and shelf support holes can be seen. Figure 14 also demonstrates that modular furniture items can be created and combined. For example, two of the cube storage units of Figure 14A are combined to form the unit in Figure 14E; four of the cube storage units of Figure 14A have been combined to form the storage unit in Figure 14G. The cube storage unit can include an internal shelf (Figure 14K). It can also be stacked, as seen in Figure 141 and 14J, in which two columns of cubes stacked three high form part of the storage unit. The furniture item in Figure 141 can also be used (or modified for use) as a room divider, or as bedhead with storage (with a bed base such as the double bed base of item labelled 735 in Figure 7 positioned against the back of the storage unit/bedhead (not illustrated). The bedhead could be extended to include a shelf (e.g. a recessed shelf or cantilevered shelf) on the front of the bedhead, accessible from the bedbase. These examples demonstrate the interchangeability of atomic parts between furniture items and again between furniture types, and the flexibility of design made , possible by using atomic units. FIGURE 16 shows schematically how furniture items can be re-configured using the same parts to make different furniture items. The furniture design system and method offers the advantage of end user-driven custom designed furniture while maintaining mass market cost efficiency. This is an advantage over prior art systems and methods, which are either expensive, or constrained to using predefined 3D component structures. The furniture design system and method achieves cost effective design flexibility through the development and use of "atomic units", which can be pre-fabricated and optimised for cost efficiency (and therefore is scalable to the end user mass market). The system and method retain the design freedom of bespoke systems and methods, because an end user is allowed unlimited design choices to create furniture items through any combination of atomic units (like a brick in a house), rather than combining a limited selection of predefined 3D component structures. The latter necessarily limits the end user to customisation of a pre-existing design, rather than enabling a end user to design from a basic building block (atomic unit). The analogy is designing and building a house from pre-fabricated building materials, cut or built to size. This approach provides more design flexibility because the basic (atomic) unit can be combined in an unlimited number of ways to create an unlimited number of furniture items. They can also be disassembled and reassembled to form a different item of furniture. The atomic unit can be assembled with other atomic units or combined with existing furniture to repurpose or re-work the furniture into a different furniture item (e.g. as shown in Figure 16). The examples provided illustrate the interchangeability of atomic units, between different furniture items within a single furniture type, and across furniture types. The invention provides a new or alternative furniture design system and method for custom-designing furniture. However, it will be appreciated that the invention is not restricted to these particular fields of use and that it is not limited to particular embodiments or applications described herein. 2. An end user-driven design system according to claim 1 further including a dynamic pricing calculator, the dynamic pricing calculator allowing one or more cost calculations to be performed in real time as atomic units are selected or deselected, wherein the one or more cost calculations can be viewed by an end user. 3. An end user-driven design system according to claim 1 or claim 2, wherein said one or more cost calculations includes a delivery cost such that an end user can account for delivery costs while designing a furniture item. (d) a 3D form produced by a 3D printer. (c) generating one or more reports for display on a visual display. such that each atomic unit is interchangeable between at least two furniture items, including furniture items of different furniture types. 8. The end user-driven furniture design tool of any one of claim 5 to claim 7, wherein the step of capturing input for one or more design requirements specified by an end user includes capturing an end user's preference for design including contextual preference data. (c) applying contextual preference data. including permanent, semi-permanent or non-permanent; and iv. the direction of one or more other atomic units, where atomic units have a vectorial positioning in space including an up-down and an exterior-interior positioning of one or more requirements specified applied to the atomic units. wherein the visual representation is communicated to a display. 13. An end user-driven furniture design tool according to any one of claim 5 to claim 12, wherein the method includes a further step of extrapolating one or more alternative furniture items formable from one or more of the atomic units selected by an end user such that a different furniture item can be constructed using said one or more atomic units. 14. An end user-driven furniture design tool according to any one of claim 5 to claim 13, wherein the method includes a substep of assessing a vectorial relationship between an atomic unit and its physical relationship with its proposed context of use such that a relative position of an atomic unit to its context allows a furniture item to meet an intended functional use. 15. An end user-driven furniture design tool according any one of claim 5 to claim 14, wherein the step of capturing input for one or more design requirements specified by an end user includes selecting a context of use from one or more data collections containing business rules for use. (b) joins; such that the one or more cost calculations can be viewed by an end user in real time. 17. An end user-driven design tool according to claim 16, wherein said one or more cost calculations includes a delivery cost such that an end user can account for delivery costs while designing a furniture item. described by reference to the accompanying drawings. 19. An end user-driven furniture design method substantially as hereinbefore described by reference to the accompanying drawings.